Since ancient times, the olive has been associated with peace, fertility, strength, victory, glory and sanctity. Mythological stories associated with olive abound. The Cross on which Jesus Christ was crucified, was made of olive wood. Early Christianity used olive oil in baptism. Priests and kings were anointed with the oil. Olive oil was used to light lamps as it was believed to represent all that is celestial. In the Book of Genesis, the dove returned to the Ark with an olive branch to indicate that the Great Flood had ended; and since then the olive branch has been regarded as a symbol of peace and goodwill. According to legend, a cedar, a cypress and an olive tree grew on Adam's grave on the slopes of Mt Tabor. Ancient Egyptians believed that it was Isis, the wife of Osiris, who taught humankind how to grow and use olives. The olive tree was one of the first plants to be cultivated. The practice spread from central Mesopotamia to Egypt and Phoenicia and then to Greece. Because of its importance as a source of both food and light, the olive acquired religious and divine significance. Greek mythology describes how Zeus promised to give Attica to the god or goddess who offered the most useful invention. It was Athena, the goddess of wisdom and peace, who won the contest with her gift of the olive tree and its soothing, nourishing oil. Athena became the goddess of Athens and her olive tree was said to be planted on the rock of the Acropolis. Olives grow off of a small tree called the Olive tree with is part of the Oleaceae family. Olive trees are native to the coastal areas of the eastern Mediterranean Basin, from Lebanon, Syria, maritime parts of Turkey, northern Iran. The tree is most important for its fruit called the olive, which is a major agricultural importance all over the world. Olives are picked from trees before consumption and used for consumption of olives or for the olive oil. Olives come in a wide variety of shapes, sizes, and flavors which all depend on how the olives are cured and when they are picked. There are two main types of olives green and black. The only difference between these olives is there ripeness, the black being fully riped and the green not being fully wiped. Most consumers are familiar with canned black olives and commonly pimento stuffed green olives there are many more flavors and textures of olives in the world. Green olives must be soaked in a lye solution before brining. Black olives can be proceeded straight to brining. The longer the olive is permitted to ferment in its own brine, the less bitter and better the flavor will be. Green Olives which are often pitted can be stuffed with various fillings. Black olives are graded in sizes from small, medium, large, extra large, jumbo, colossal, and super colossal, and they also contain more oil that green olives. •manzanilla: Spanish green olive, available unpitted and/or stuffed, lightly lye-cured then packed in salt and lactic acid brine. •picholine: French green olive, salt-brine cured, with subtle, lightly salty flavor, sometimes packed with citric acid as a preservative in the U.S.
•kalamata: Greek black olive, harvested fully ripe, deep purple, almond-shaped, brine-cured, rich and fruity flavor. •niçoise: French black olive, harvested fully ripe, small in size, rich, nutty, mellow flavor, high pit-to-meat ratio, often packed with herbs and stems intact. •liguria: Italian black olive, salt-brine cured, with a vibrant flavor, sometimes packed with stems. •ponentine: Italian black olive, salt-brine cured then packed in vinegar, mild in flavor. •gaeta: Italian black olive, dry-salt cured, then rubbed with oil, wrinkled in appearance, mild flavor, often packed with rosemary and other herbs. •lugano: Italian black olive, usually very salty, sometimes packed with olive leaves, popular at tastings. •sevillano: Californian, salt-brine cured and preserved with lactic acid, very crisp. •spanish style green olives: Green olives fermented for 4 to 6 months in an acid solution packed with 8% salt brine to give them a salty flavor. •sicilian style olives: A medium green color olive that is cured in a salt brine and preserved with lactic acid. Made from a larger sevillano variety, they are crisp and salt. 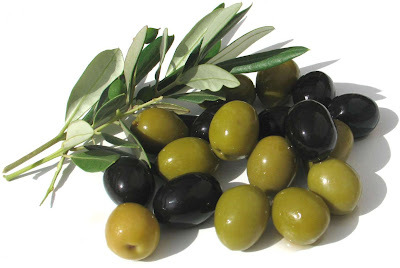 •Greek Style: Made from olives that have been allowed to ripen on a tree. They are dry salt cured and rubbed with olive oil. They are very strong tasting, black, and wrinkled. Olive oil is one of the oldest natural ingredients in the world. The history of Olive oil dates back almost 8,000 years to when the first tree were cultivated in the Middle east. Olive oil offers a wide range of flavors, colors and aromas that vary with the nature of the soil and climate where the olives are grown. Olive oils differ in quality, smoke point, color, flavor and aroma, each having its own purpose. It is used in many types of cooking for its rich, delicate flavor. More than 90% of cultivated olives go into oil production, and it accounts for four percent of the worlds vegetable oil production. Olive oil contains omega 3 and is recognised as helping reduce cholesterol. It is 100 percent fat, has no protein, no carbohydrates, no sodium, no cholesterol, no minerals but a trace of vitamin E. The fat contained in olive oil are good fats because the are Omega 3 fatty acids.